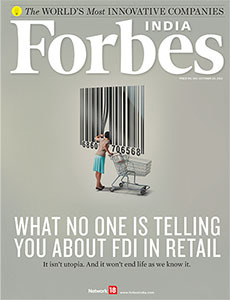 When ignored at a party, a little trick that always works is to drop a random line or two on what you think of foreign direct investments (FDI) in the modern retail business. Without a doubt, ears perk up and practically everybody seems to have an opinion—at times considered, at others uninformed. It’s been that way for as long as most of us can remember and arriving at a consensus seemed a chimera. Be that as it may, and just when everything seemed stuck in limbo, late last month the government unleashed a spate of policy reforms. These included opening up the Indian retail business to foreign chains. The howl of protests that followed from certain quarters was shrill; and the applause from other quarters was equally loud. But the truth, as it always does, lies in quiet corners and refuses to raise its head unless you actively seek it out. That is why we turned to three veterans in the retail business to help us tell the truth as it is. Rama Bijapurkar, S Raghunandhan and R Sriram, co-founders of Next Practice Retail, have been both witnesses and participants in this evolutionary tale. Over the last couple of days, they put in their years of experience and pored between the lines to tell us what to expect realistically. Their prognosis is a straightforward one. Those on the shrill side of the fence ought to temper down because the dynamics that drive business in India are very different from other parts of the world. To that extent, fears that it is only a matter of time before traditional kiranawalas and small businesses will be on the streets, is a misplaced one. And for those frothing with optimism, their prescription is similar. Tone down. It takes time to figure this complicated nation out, and lessons learnt from other parts of the world cannot be arbitrarily imported or imposed. On a different note, we hosted the Forbes India Leadership Awards (FILA) on September 28. It was a lovely evening with some of the finest minds in attendance. In a departure from convention, we decided to do away with monologues and chief guests and instead asked seven of them to speak for no more than three minutes each on ideas now occupying their mind space. The outcome made for riveting listening. The proceedings were telecast live on www.youtube.com/forbesindia. For those of you who missed it, the event continues to be there for viewing at your convenience. As always, a line of appreciation or thoughts on what you think we can do better is always welcome. Kerala, with Congress led government has said it would not allow fdi in retail. This is astonishing as it would go a long way in stabilizing both cost and quality. The whole concept that FDI in retail will write off mom.